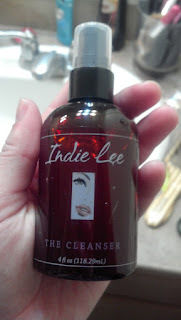 I received an exciting little package in the mail a couple weeks ago and inside was Indie Lee's "The Cleanser." I won it through a giveaway on her Facebook page so it was totally free (!) and it even arrived within about 2 days of winning, which was totally surprising and awesome. Anyways, if you're not a Facebook fan of hers, you are missing out because she constantly does giveways, discounts, and advertises when you can find her on sites like Hautelook and get some great steals and deals. Also, if you didn't know this already, she is a part of the beauty membership service, Beauty Army. If you sign up for that service for $12 a month, it's a very good chance that one of your six samples you choose will be something by Indie Lee. It's a great way to test out her products and know what you think before splurging on the full size. Anyways, here's the details!! Indie created this gentle, effective, double-duty cleanser to wash away impurities and remove makeup naturally. A perfect start and end to every day. INGREDIENTS: 100% Natural: Purified Water, Decyl Glucoside, Disodium, Coco- Glucoside Citrate, Coco-Glucoside, Glyceryl Oleate, Hyrdolyzed Wheat Protein, Xanthan Gum, Strawberry Oil, Lycopene, Phenozythenol*, Ethylhexyglycerin * *Derived from natural sources. The day I received this in the mail, I wasn't wearing any makeup so I thought, hey I should wash my face right now! I unwrapped this little guy, and used the pump top to squeeze out a couple pumps of product. As soon as I started slathering it on my face, I smelled strawberries! Now that is not a scent that I normally associate with skincare, but I like it! I was pleasantly surprised to be getting a yummy natural product that had a light scent of strawberry! What I love about this product is the pump top and the cap. If I want to travel with this, it's not going to leak everywhere because it's well protected. Also, I love that it's natural, I love the smell, and I love the way my face feels! Have you ever washed your face with something and it still feels dirty? Or it feels clean but your skin feels tight and dry afterwards? This stuff really got into my pores and dug out all the yucky stuff but my skin felt hydrated and smooth after. This stuff is the best! I can't wait to try out her new body lotion she has come out with. Thanks Indie Lee for making me your contest winner! Yet another fabulous product. If you want to read more reviews on her products, find the search bar within our blog site, and type in "Indie Lee" and you will be presented with all the blog postings we have written on her fab products!